Tata Indicom , the CDMA brand of Tata Teleservices Limited , has announced the launch of an exciting new value added service – ‘Meet and Greet Aamir Khan’ for its customers. The offer allows customers to not only win daily cash prizes but also get an opportunity to meet Aamir Khan. To participate, subscribers simply need to download the exciting new game ‘3 idiots-Rancho Run’ from TATA Zone. 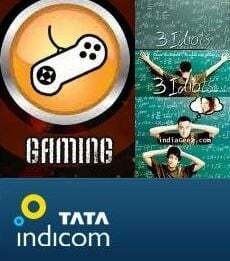 All TATA Indicom subscribers with BREW handsets and an access to TATA Zone can avail this offer till 24th January 2010. The highest downloader of the game will win a daily cash prize of Rs 1,000. The monthly winner gets a chance to meet Aamir Khan, one of the main characters of the movie 3 idiots. The service comes at an affordable price of just Rs 10 for 3 chances. The game 3 Idiots-Rancho run, is a unique and an innovative game based on the storyline of the most awaited movie 3 idiots. The player has to help Rancho get Raju’s father to the hospital before time runs out and it’s too late. He will have to ride through the city’s serpentine traffic in this race against time. This quick paced racing game is spread over 5 levels of insane traffic, the player will have to score points and gain time bonus to extend the game play.